Century Grasshopper Single-Burner Propane Stove, Steel color by Century Tool at Kerinci. MPN: 4687. Hurry! Limited time offer. Offer valid only while supplies last. 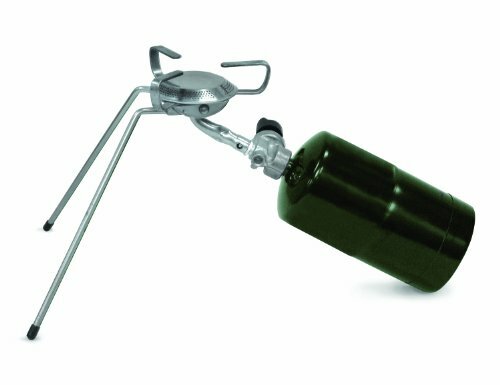 Century Grasshopper Single Burner Stoves offers you a collapsible propane stove is lightweight and easy to use with weight less than 2 pounds. Century Grasshopper Single Burner Stoves offers you a collapsible propane stove is lightweight and easy to use with weight less than 2 pounds. Pressure regulated for consistent performance and even cooking. With 3 3/8-Inch, 10,000 BTU stainless steel burner. Our tripod design provides superior stability, with foldable legs for easy portability. The valve and tube assembley are included, with exception of the 16.4oz propane cylinder that is not included. If you have any questions about this product by Century Tool, contact us by completing and submitting the form below. If you are looking for a specif part number, please include it with your message.